A site designed to put women in their place - at the helm. Full of 'how to' articles ranging from navigation to childrens safety. Plus a forum where women can ask questions, post opinions or just meet other women boaters. Sites about horses that qualify as foundation-bred under the National Foundation Quarter Horse Associations (NFQHA) guidelines. Foundation established by NBA basketball player Detlef Schrempf 'to strengthen the lives of children and families in the Northwest USA by raising funds for various childrens charities and youth organizations'. Missions of the Foundation, events, press releases, response form, links. Awareness, protection, preservation and conservation of the global marine environment are the heart of the Save Our Seas Foundations mission. Save our Seas Foundation is a non-profit making Swiss foundation headquartered in Geneva, Switzerland. A non-profit research foundation devoted to primary immune deficiency. Dr Joseph Strausss foundation. Newsletter and a discussion forum. 6 The Billy Foundation William S.
William S. Graham Foundation for Melanoma Research. Located in Hayward, California. This foundation offers patient information and literature, videos and treatment options. Not-for-profit foundation helping uninsured low-income patients to obtain the Mirena intrauterine contraceptive system. Foundation whose purpose is to support and protect the principles of reflexology. In Dutch, English, and German. Charitable organization to honour the memory and accomplishments of this Canadian driver. Career highlights, foundation background, news and donation information. Residential and prison based therapeutic communities. Non-profit foundation is holistic and comprehensive in approach and geared towards all cultures and genders. In Tucson, AZ. Nonprofit foundation, located in Olney, Maryland, dedicated to educational and charitable activities including the rescue of abandoned, neglected, and injured birds. Nonprofit foundation dedicated to the rescue of abandoned, neglected and injured birds. Find information about volunteering and adopting, donations and photographs of the current flock. Preserving foundation show bloodlines of Winks and Bond in Minis, Crescent in Shetlands. Features horses for sale and foundation bred stallions at stud. Located in Lamoille. Standing stallion, Just Talk About. Horses for sale, foundation pedigrees. Located in Brandenburg. Photographs of some of the past great Australian Shepherds and some well known champions. Links to other sites of foundation dogs. Ring of web sites dedicated to the breeding of foundation-bred Quarter Horses. Offering foundation bred Quarter horses for roping, western pleasure, or halter. Standing stallions at stud. Located in Kilgore. A non-profit foundation based in Phoenix, Arizona that provides financial assistance to dogs while in foster care. Online auction and rescue stories. The foundation supports programs that encourage youth to dream big dreams, engage the community in helping youngsters pursue their goals, and ensure young peoples access to developmental opportunities in society. A resource where parents learn new effective parenting skills. This foundation provides a source of information for parents, giving them the tools necessary to create an encouraging, and loving home for their children. Nostalgic look at the fashion history of the girdle and foundation garment. Articles about foundation bred Quarter Horses from present day back to the colonial era with six generation pedigrees accompanying some of these articles. U.S.A. Breeding foundation-bred Quarter Horses for cutting. Standing a palomino son of Peppy San Badger. Located in Groveton. An unofficial web site of the J.I. Case Heritage Foundation, steam traction engines, threshers, early gas tractors, photos, and show dates. International nonprofit association dedicated to promoting,preserving and exhibiting foundation Quarter Horses. Site includes registry information and conformation guidelines. Dedicated to maintaining the fostering the use of the unique bloodlines of the foundation Quarter horse. Offers membership and news, futurity information, officers, shows, classes, and events. A support site for individuals and professionals dealing with Sturge-Weber syndrome, port-wine stains and Klippel Trenaunay. The Foundation acts as clearing house for information and a focus for research. Founded to preserve and promote the original versatile bulldog Foundation Quarter Horse in the southeast. Contains calendar of events, stallion service auction, rules, forms, and show results. If the business hours of Women on Water - A Womens boating resource center in may vary on holidays like Valentine’s Day, Washington’s Birthday, St. Patrick’s Day, Easter, Easter eve and Mother’s day. We display standard opening hours and price ranges in our profile site. We recommend to check out boatingsafety.com/wow for further information. 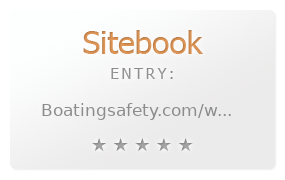 You can also search for Alternatives for boatingsafety.com/wow on our Review Site Sitebook.org All trademarks are the property of their respective owners. If we should delete this entry, please send us a short E-Mail.